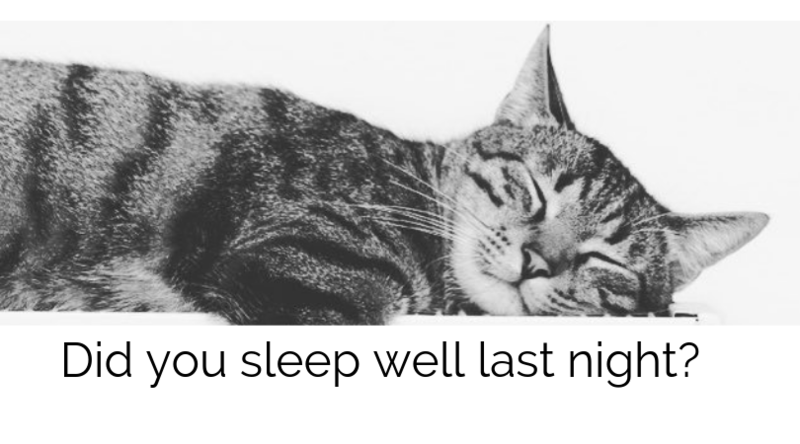 Do you feel like you sleep well every night? Most of us these days don’t get enough sleep, and it’s more important for our health than we realise. Matthew Walker’s recent book “Why we Sleep”* makes very interesting bedtime reading. He points out that it is a recent phenomenon in our human history to be forced to stay awake for longer hours than we want to, whether that’s because of work or social pressures. Somehow sleeping less has come to be seen as better than having the full 7 or 8 hours that we really need. There is plenty of evidence for the negative impacts of loss of sleep on our health, as well as the increased risk of accidents while drowsy and lowered productivity or poor judgement due to tiredness. In other words, “the shorter you sleep, the shorter your life span”. On the one hand, this is all scary stuff, but on the other hand, it’s easy to fix – if you can value your quality of sleep and ensure you get as much as you need then your body and brain will be able to restore your health and energy. Our bodies function according to a body clock called the circadian rhythm which is hard-wired into us and linked to day/night cycles. All our bodily functions work in a rhythmic cycle throughout the day and night. At night, sleep is not just a passive phase, like switching off the lights, it’s a very active time for the brain. During the night, we go from light to deeper levels of slumber and back again several times in a repeated pattern. Dreams occur in the lighter phase of sleep and in the deeper dreamless sleep our brains are very active processing our memories and experiences. Each kind of sleep has a purpose. Here’s the important point though – in the early part of the night, before midnight, our sleep is deeper, mostly dreamless sleep but as morning approaches there is more light dreaming sleep. So when we stay up late we miss out on the deep sleep, and when we get up artificially early we miss out on dreaming sleep. There is no way around this since the pattern of our sleep is defined by our inbuilt circadian rhythms. So loosing sleep really is “burning the candle at both ends”! How to improve your sleep quality. Have a regular sleep schedule – this is the most important tip. Go to bed and get up at the same time each day, even at the weekends, and make sure you have enough bed-time to get your full night’s sleep. Being regularly physically active helps you sleep (although not just before bedtime). Get some sunlight or at least natural daylight every day. It’s too easy to live an indoor life these days, but natural daylight is key to regulating the bodyclock. Medications that delay or disrupt sleep – if you think your medication is disturbing your sleep discuss this with your GP. Naps are good – but not after 3pm. Naps are fine to help make up for lost sleep but if you nap later in the day it will reduce your need for sleep that night. Relax before bed – it’s not the right time to get last-minute things done, it’s the time to unwind and allow yourself to get sleepy. Make that a habit and look forward to a good sleep instead of trying to do too much. Cool down – a hot bath before bed is recommended because it’s relaxing and more importantly cooling off after you get out of the bath helps you to fall asleep. Keep your bedroom temperature on the cool side – your body temperature needs to drop slightly as you fall asleep. Darkness – proper darkness is a rare thing in cities. Street lights nowadays are often LED bulbs which are energy efficient but the wavelength of the light encourages wakefulness. Screens on TVs, PCs, phones and other devices are similar – the light will wake you up. Have curtains which properly block out unnatural external light at night. Turn down or remove all sources of light in your bedroom. Make your bedroom a gadget-free and device-free zone. Clocks, phones, tablets etc will either have some light or will potentially disturb you with sounds. Eliminate these as much as possible. You can even turn the bedside clock away from you so you can’t clock-watch! Pillows and mattresses – be comfortable, well supported but free to adapt your position and coverings as you wish. Don’t lie awake – if you can’t fall asleep then get out of bed and do something relaxing. Being anxious about sleep won’t help you sleep!